A funny little detail to attend to before moving back to the States - rolling loose change. We've collected quite a bit. As I watched the girls counting and rolling I realized why we have so much. 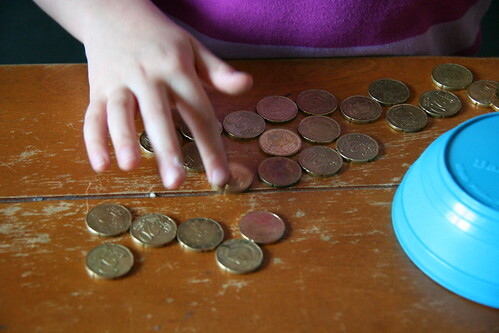 There are twice as many coins in Europe as in America. I also think that having 1 euro and 2 euros as a coin, mentally diminishes its value. It doesn't seem like what it is (especially if I think of it in dollars.) Bills seem like "real" money or something substantial. But the coins here can add up very fast into something "real." The first bill in the Euro is a 5 euro bill. 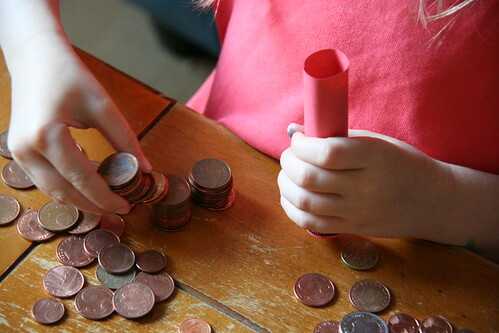 BTW, if you're looking to keep your kids occupied have them roll coins. My kids loved this. After the first day they asked to do it the next. They even asked about it in the car on the way home from school. 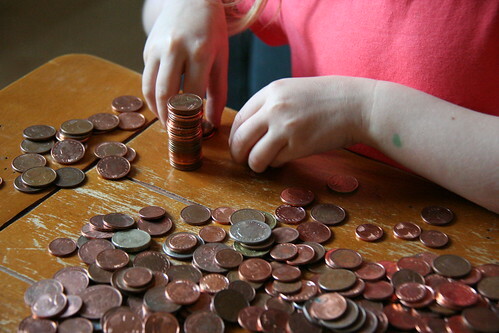 What are the coin denominations where you live? Read all the Little Differences here. I would be so confused with Euros! lol I'm in the states. We also have .50cent pieces, and 1.00$ coins.I don't like the 1$ coins as they almost the same size as the quarter and I have used them thinking them as quarters! grrr Me and my husband collects the .50 cent pieces. He has a coin collection from all over the world as well. ( he was military and stationed everywhere!) and I have had friends from Sweden sent me different coins as well. Suzee - Yes we have 50 cent pieces but they are not really common . . .at least in Seattle. As for the 1$ coins, I thought they were issued for a limited time or for something special. They aren't in regular circulation are they? I haven't been gone that long :) Or have I? in Japan we have ¥1, ¥5, ¥10, ¥50, ¥100, ¥500 the 1,50, 100 and 500 are silver, the 5 and 50 have a hole in the middle. I found that in the states I was sick and tired of carrying wads of notes and not really having any money of value! lol it did make me feel rich at first.. but seriously coins are cool :) and easy for me to give the children the 10 and 20 cent pieces for their money box. Jacob gets a gold Sakajuwea dollar coin from the tooth fairy. (Just so you know what she pays in this neighborhood). You have to visit the bank to get a stash of them though. He has used them to pay for things he wants. I don't like it when I have them in my coin purse though. I forget about them. I bought a coin holder here. it's round and metal (but light) and holds all the Euro coins in separate stacks. Makes whipping out exact change a breeze. I have finally learned that the 20 cent coin has "ruffles" on the edges and the 50 cent coin just has ridges all the way around. I have totally adapted to the €1 and €2 coins - and I wish the US would get rid of the dollar bill and give us something similar. Dollar bills get worn too quickly. Where did you get the coin sleeves for rolling? I have a bucket of change I would love to roll. Hi Anita - just go into your bank and ask for them. They are free. Good luck! In England, coins aren't rolled; they're bagged. Drives me bananas. I used to be able to tell how much was in a roll by its length. We have 1p, 2p, 5p, 10p, 20p, 50p, 1pound, and 2pound coins. Five pence coins are uber tiny. When I'm on the continent, I can't tell what I have or what the value is. One day, I'll get the hang of it. This is really late in the game, but I would like to point out that Euro coins are easy to read since you have the value stamped on them, which are the same as their names. not very easy for foreigners!